Quest for Passion 2018 - Trio Inferno in "Sensorium"
"Quest for Passion* aims for communication und emancipation by music. Marialena Fernandes and her European musicians encountering an open minded local Indian audience. 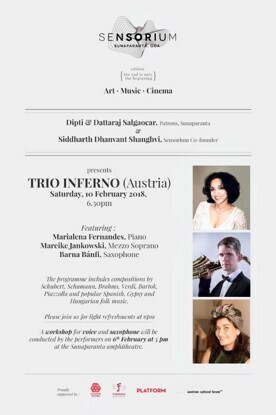 Trio Inferno: Mareike Janowski, Mezzo Soprano. Barna Banfi, Saxophone and Marialena Fernandes, Piano present music by Schubert, Brahms, Schumann, Piazzolla, Verdi, Bizet a.o.